- The altar cloth for this set up is actually a sarong. Our wooden Celtic boxes can be used to hold Tarot decks, rune stones, pendulums, and more. Silver candles represent intuition and mystery, as do the tumbled moonstones. A statue of your spirit guide or totem, such as the Vigilant Gryphon, let you call on forces outside yourself for help. 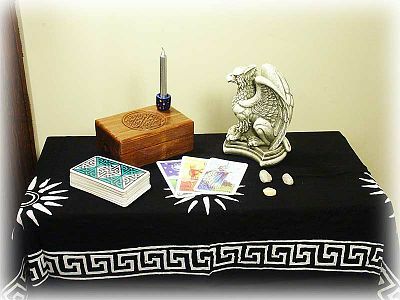 Do you have any other questions about our Divination Altar? now this is a good example of a divination alter or that part of an altar . Good job.